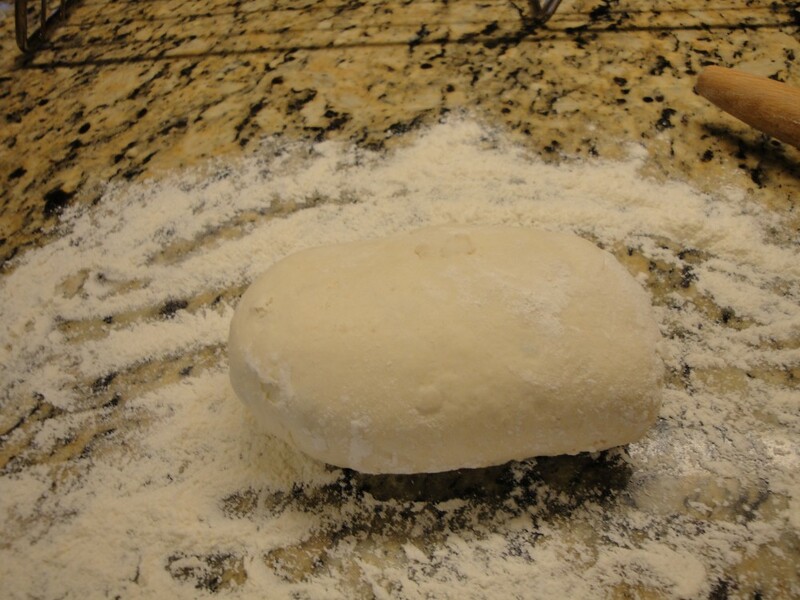 The first step is to make a sponge this could be done a day a head or just 2-3 hour before making the dough. 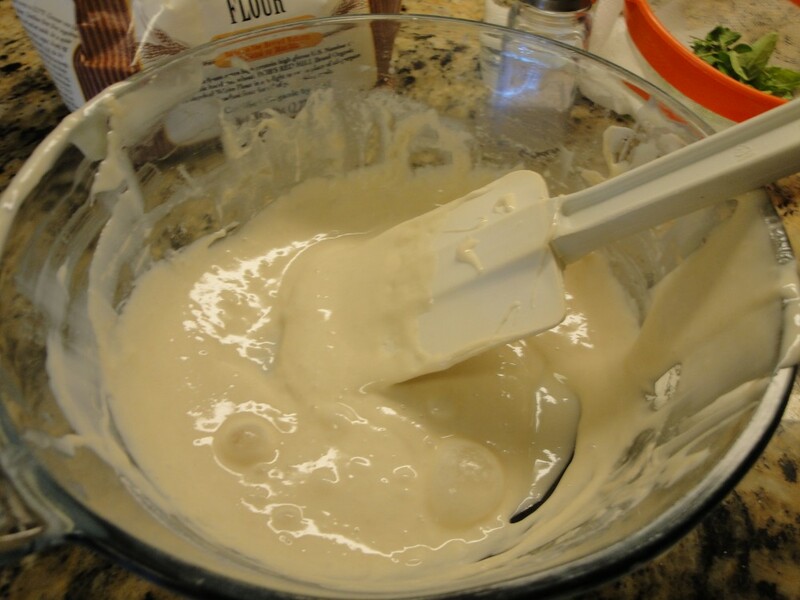 To make the sponge you need active sourdough starter. Later I will go into more detail about sourdough starters, for now( http://www.sourdoughhome.com/index.php) under links on blog sidebar. 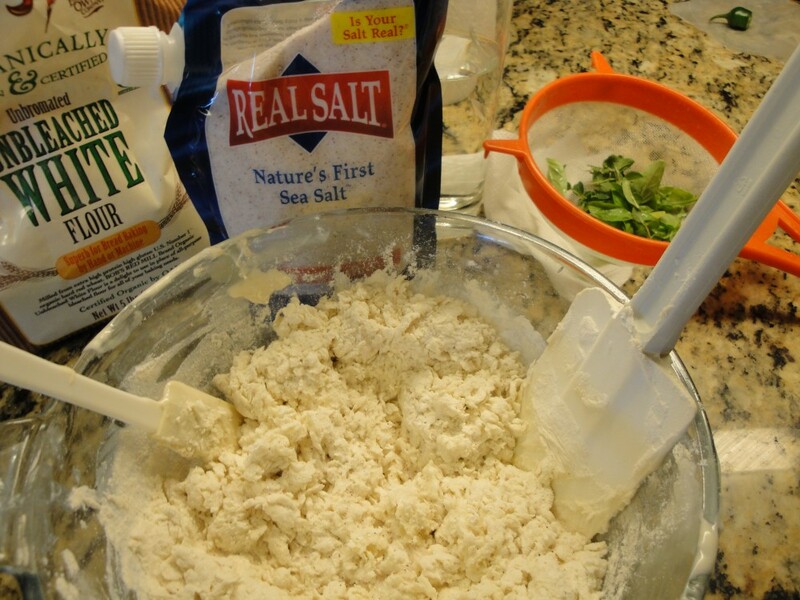 Mix together cover loosely and let set at room temperature for 2 to 24 hour. This is what’s known as the sponge, almost all sourdough recipes will call for this. 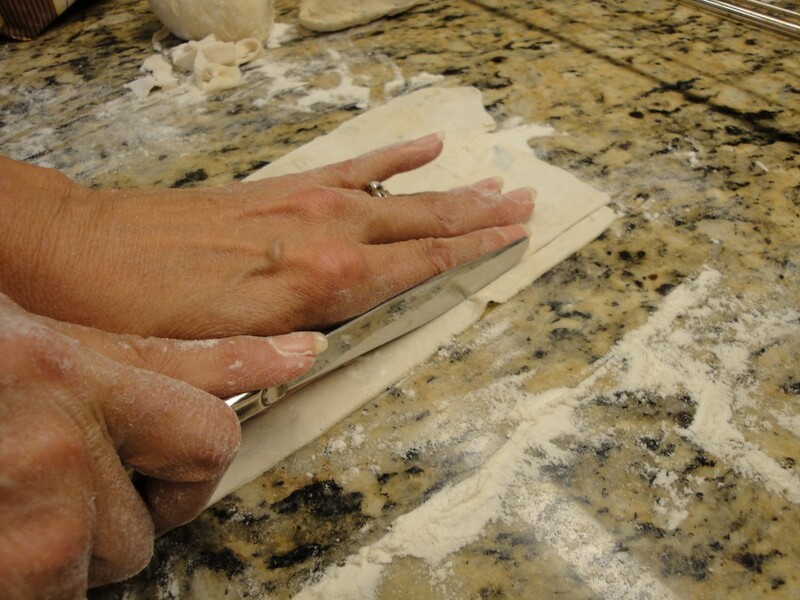 Mix flour and salt, cut in sponge with pastry cutter, or a fork, or by hand. 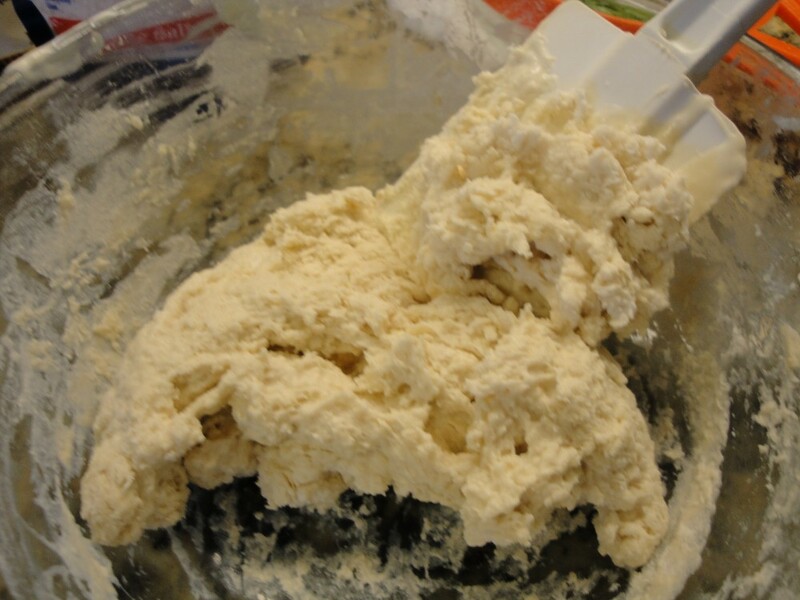 Add most of the water, sometimes the dough will need less than 1/2 cup sometimes a bit more, it should look like this. 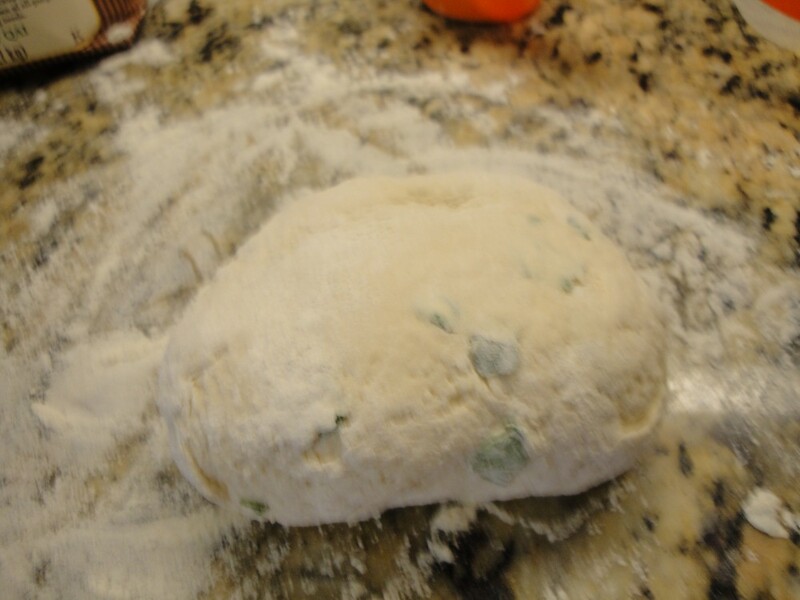 Place some of the extra flour and the torn herbs, on a clean dry surface for kneading and rolling out the dough. 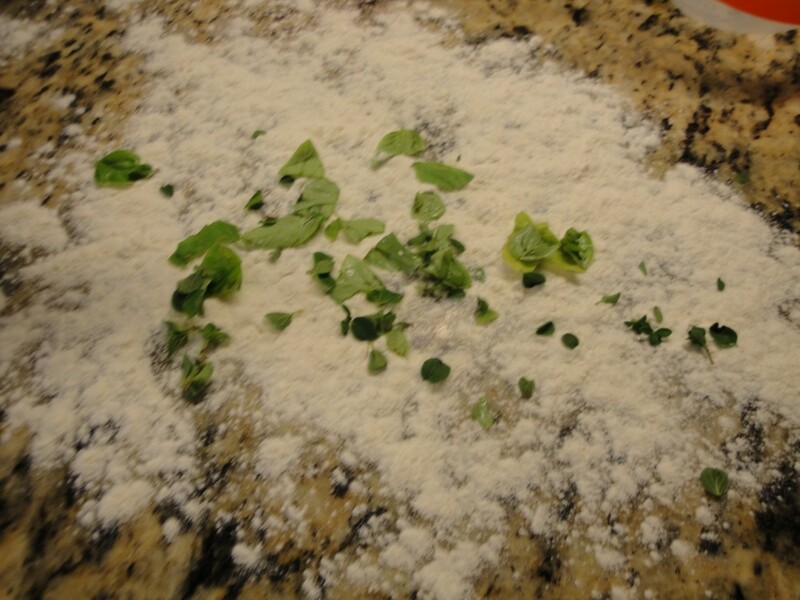 Add the dough. 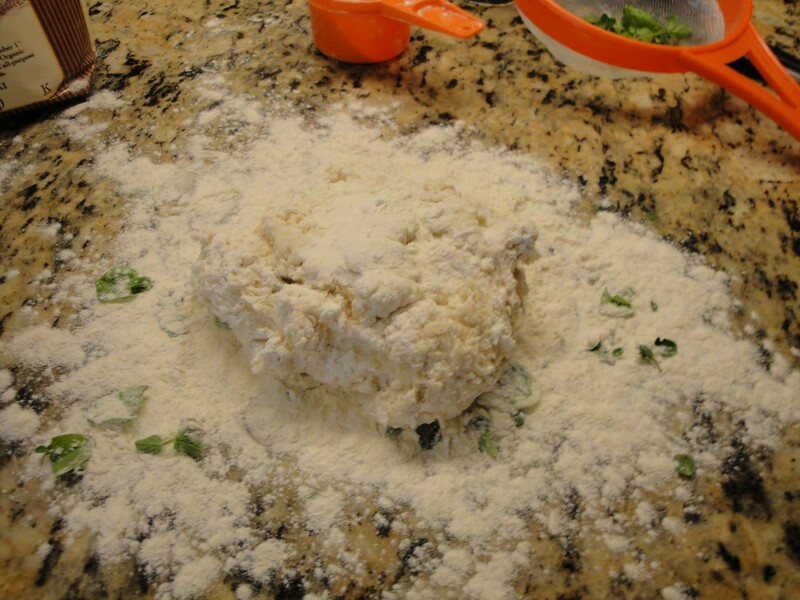 Knead it. Let rest 1 hourish. Knead the dough, again it will continue to pick up bits of the herb, and be sure to keep enough flour is on the work surface to keep the dough from sticking. 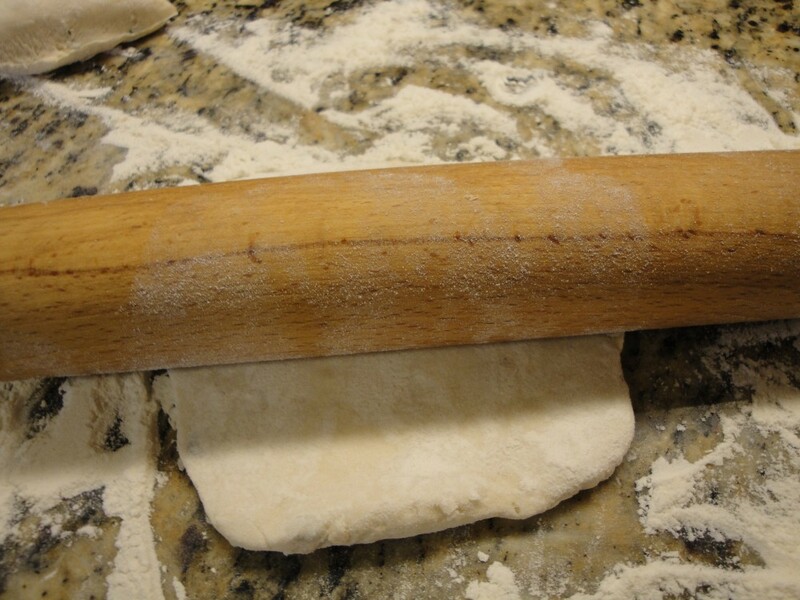 Roll the dough out, with a rolling pin lightly coated with flour. I went very thin around 1/8 inch thick, and cut into about 1/4 inch wide strips. 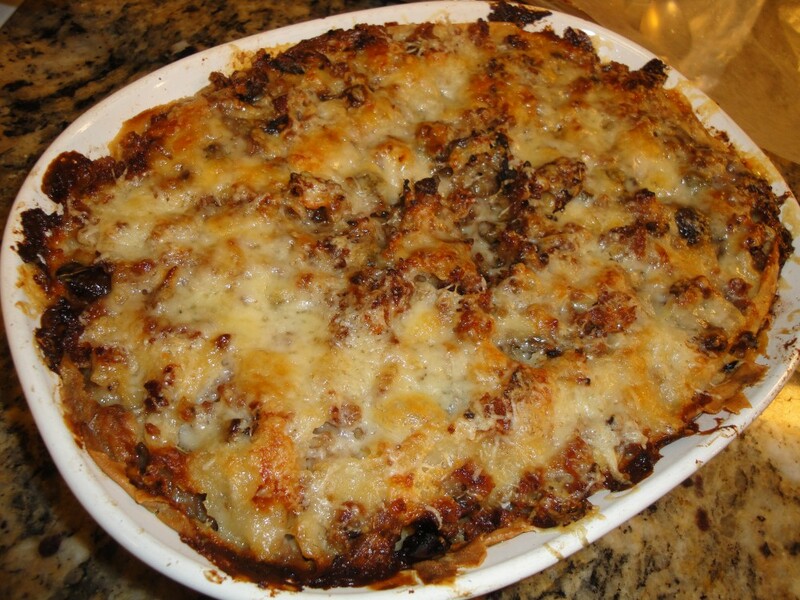 or left the sheets flat for lasagna.The pasta gets bigger when it cooks. 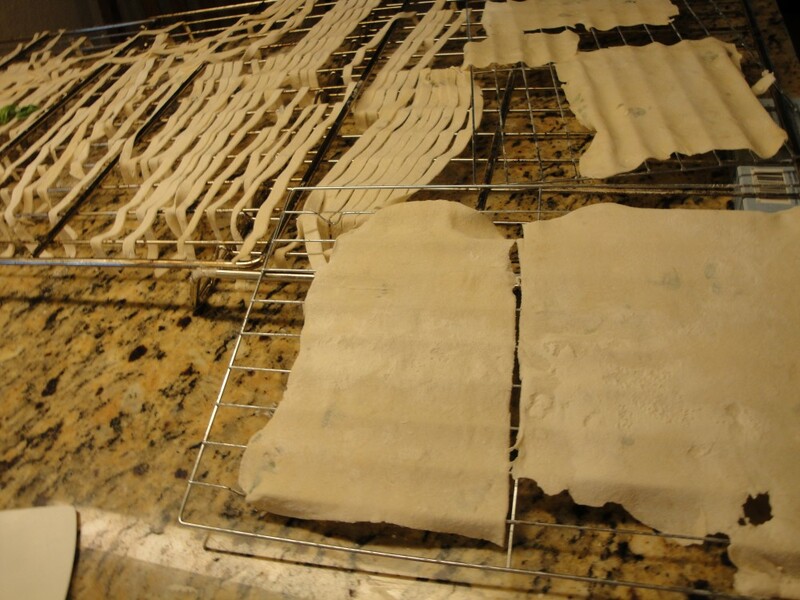 I do not have a pasta machine so I can’t tell you if the dough works in one, but it makes sense to me that it would. 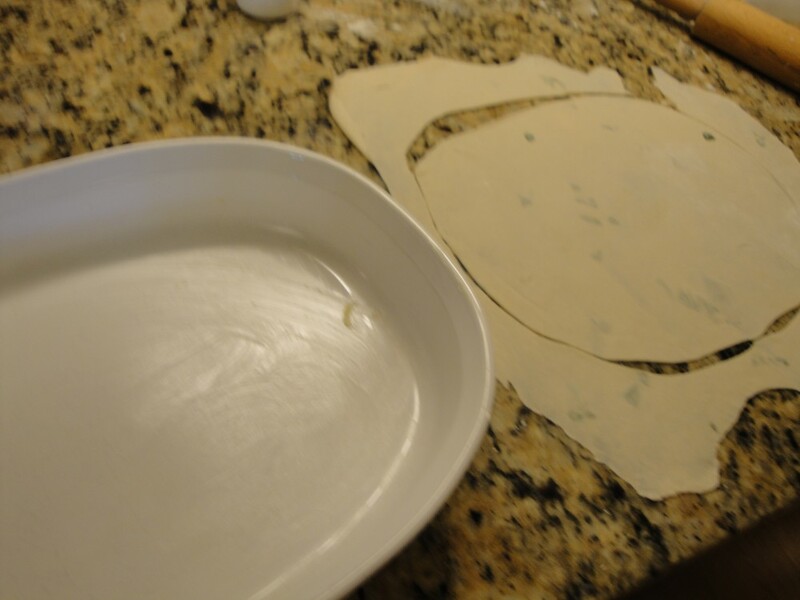 Now hang the dough over some thing to dry. If you make any flat sheets like I did, just lay them out but they need to be turned. 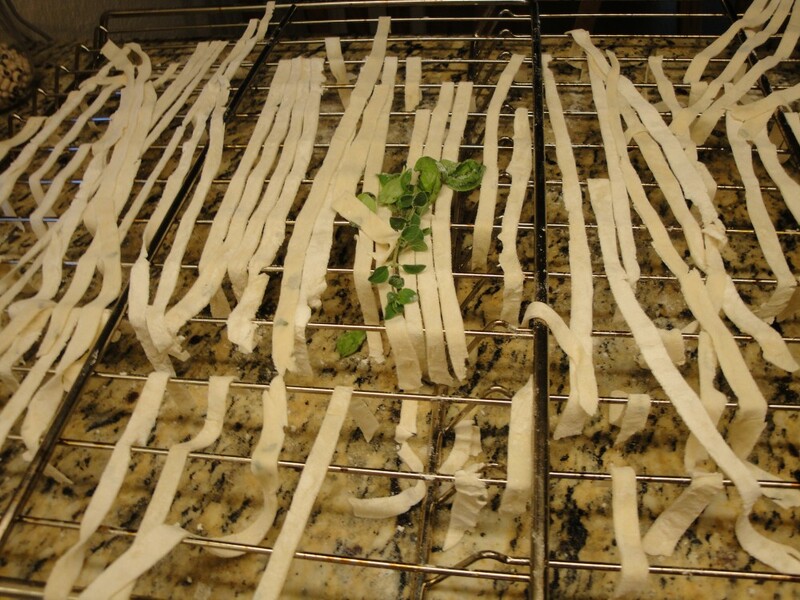 Many pasta recipes, say you can just lay it out in one a flat sheet and cover it if cooking the pasta the same day, then cut as needed before cooking. 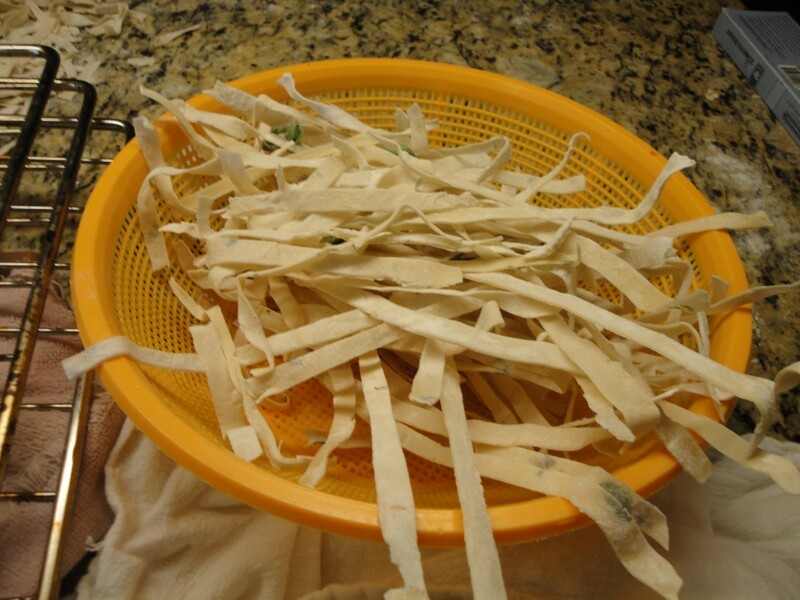 The pasta needs to be completely dry to store in an air tight container, for later use. 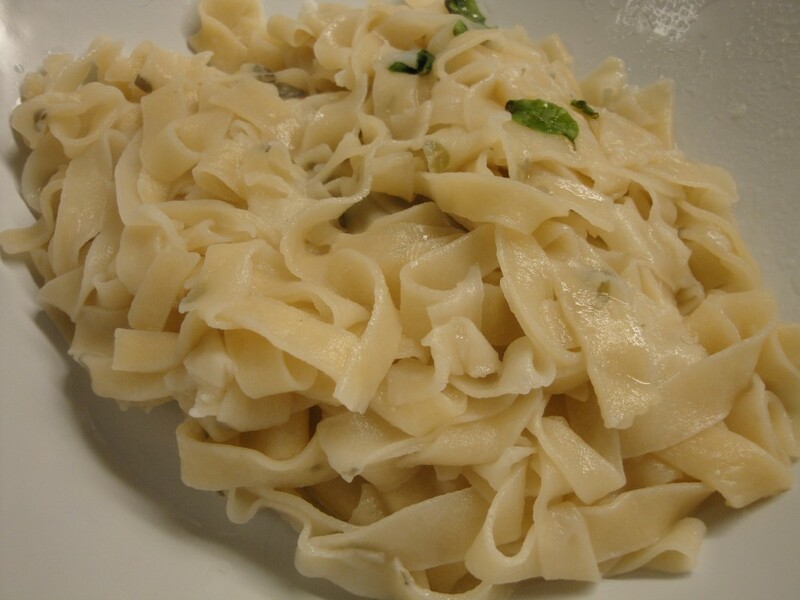 This pasta is very delicate, and cooks quickly, I recommend boiling for only 2 minutes in a very well salted water (use unrefined sea salt) testing for doneness it should not take more than 5 minutes at most. But go on the side of under cooked, because it will continue to cook, and the hot sauce will also cook it more. Tongs will tend to break, so it best to not stir it. 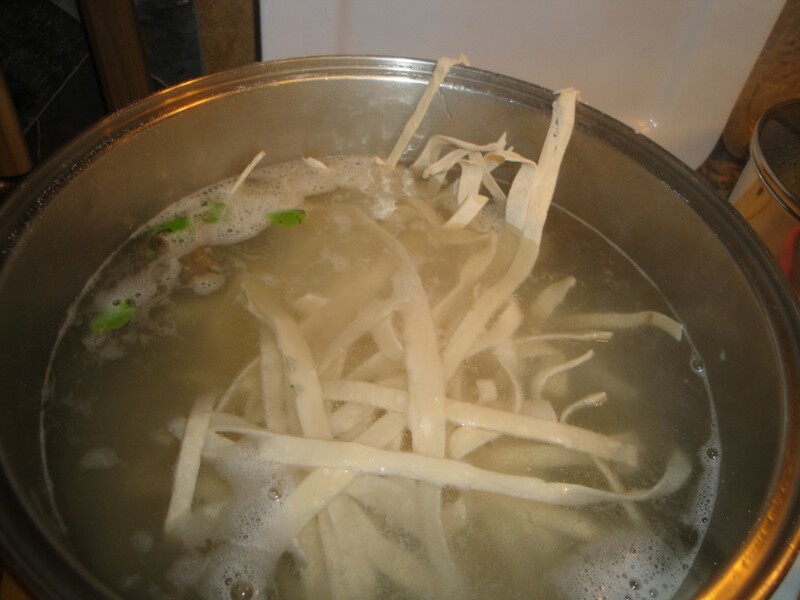 Add cold water to the pot to stop the cooking, or drain off the cooking water, but save some to add back if needed. This has been a fabulous each of the 4 times I’ve made it. 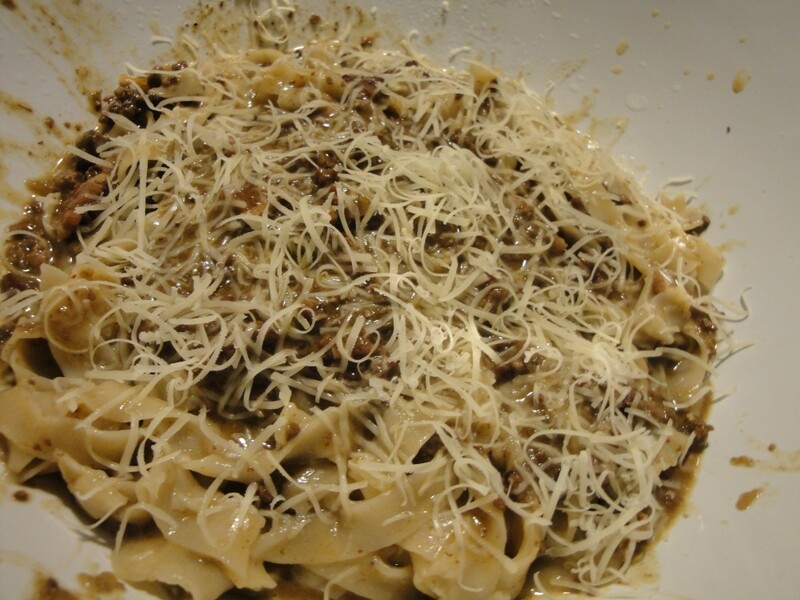 First with a simple fresh gold tomatoes sauce, then my home-made Bolognese Sauce, and twice with my home-made White Lasagna. Enjoy!